The Center for Engaged Learning and Teaching (CELT) provides pedagogy workshops and seminars, book clubs, one-on-one consultations, a lending library, and assistance with teaching portfolios to faculty, staff, postdocs, and graduate students who are or will be teaching. The proposed programs listed below are subject to change to reflect the needs and desires of Tulane’s faculty. CELT Brown Bag Workshops are held frequently throughout the semester on a variety of topics of interest to faculty and/or anyone engaged in the classroom. Essentially informal conversations, these workshops are led by a member of the Tulane community on a topic of their choice. This is an opportunity for faculty at all ranks, from, adjunct to full professor, as well as graduate students, postdocs, and staff who are interested to meet and talk about teaching and showcase the innovative work they’re doing in their classes, with the aim of improving the classroom experience for students. Major Brown Bag themes include pedagogy, mentorship, diversity, technology, faculty wellness, and HR topics. The Brown Bag Workshops are among CELT’s most popular and well-attended programs. RSVP for any/all programming with Ariel McFarland. Please click here to see the full list of upcoming Brown Bags. Click here for a print-friendly copy of CELT's Spring 2019 Programming Schedule. Please click here for On-Demand Access to Magna Publications Online Seminars. If you are interested, each seminar requires a unique password. Please contact CELT for the required password. Please click here for videos and notes from previous Brown Bag Workshops. This seminar is an introduction to service-learning and a syllabus development workshop. It covers theory around pedagogy, campus-community partnerships, the place of civic and democratic values in the university, diversity & inclusion, and institutional identity. At the same time, it is grounded by a very practical goal: helping participants develop, revise, and improve their service-learning courses and syllabi. For more information please contact Ryan McBride. The CELT Faculty Book Club provides 10 educators, from across departments and schools, the opportunity to read and discuss books on a variety of pedagogy and learning theory topics. Conversations range from the macro level, how to improve the academy, to more micro topics relating to each participant’s individual class. Most importantly, the book club creates a structure in which participants can talk about teaching in a supportive environment around a common theme. The book club meets twice per semester, usually on campus, and CELT pays for the books, food, and refreshments. Please sign up with Ariel McFarland. Learning to learn is the key skill for tomorrow. This breakthrough book builds the foundation every student needs, from freshman orientation to graduate school. Recent advances in brain science show that most students’ learning strategies are highly inefficient, ineffective or just plain wrong. While all learning requires effort, better learning does not require more effort, but rather effectively aligning how the brain naturally learns with the demands of your studies. This book shows you what is involved in learning new material, how the human brain processes new information, and what it takes for that information to stick with you even after the test. Did you know neuroscientists have shown that memories are made while you sleep, and by studying right before sleeping you can make stronger memories for your information? In this book the authors explain the role that sleep, exercise and your senses play in learning; how memory works and what makes the brain pay attention; the importance of your mindset towards learning and pattern recognition; as well as new breakthroughs in brain science that can enhance your ability to learn new information and make later recall (for tests or everyday life) easier. This book will put you on the path to reaching your full learning potential. At the end of each semester CELT hosts Faculty Grading Breaks to reward you for all your hard work. Past events have featured crepes and gelletes from Crepes Rendezvous, wine or champagne, and massage chairs. They are a great way to socialize, eat, and relax during the often stressful grading period at the end of the semester. Please RSVP with Ariel McFarland. Faculty Learning Communities are groups of 4 to 12 faculty members, engaged in a collaborative year-long study of a pedagogy, teaching-related, or leadership theme, held at least monthly. The purpose of FLCs is to provide faculty with the opportunity to study a pedagogy related topic, in-depth & in a small cohort, foster interdisciplinary communication, and to produce materials (guides, workshops, scholarly articles) that can be helpful to the larger community. Identify resources on Tulane’s campus and off-campus (e.g. online) to advance faculty competence and student engagement in learning through difficult conversations. Identify potential contributors to academic challenges including quantitative data (admissions GPA, MCAT, pre-identification as “at risk” or first-generation college student) and qualitative data (knowledge of outside stressors, medical issues, learning difficulties or need for accommodations). Imagine speed dating, but instead of romantic hopefuls sitting across from each other at small tables, picture Tulane professors, eager to join forces, interested in the development of an innovative, interdisciplinary class. This workshop brings together professors hailing from many different fields of study. Each round, two professors, paired randomly, sit down for 8 minutes and develop a class or paper they could work on together. After four or five rounds, the group then votes on the most creative idea and the most actionable idea. Faculty members are teachers, researchers, writers, mentors, colleagues, administrators, collaborators, artists, activists, and humans. During a single day, we may play all of these roles at some time, and sometimes we play multiple roles at once. Some of these identities overlap with and reinforce each other, while others challenge us with their conflicting demands. Sparking Success is a platform where faculty of all disciplines and experience levels can share best practices, innovative approaches, and practical ideas to enhance any aspect(s) of faculty life. CELT, in partnership with the Office of Graduate and Postdoctoral Studies (OGPS) offer a day-long teaching workshop in mid-May for graduate students and postdoctoral fellows who have or anticipate having a teaching assignment. The workshop will offer both large format discussions as well as smaller, breakout sessions. Workshop topics typically include classroom management and setting boundaries, leading discussions, collaborative/group work, grading, and active learning. If you have any questions about the GTA Workshop content, schedule, or would like to present as a workshop leader please email Emily Gatehouse at egatehou@tulane.edu. CELT and the Office of Graduate and Postdoctoral Studies (OGPS) have partnered to host the first Graduate and Professional Education Summit with nationally-recognized plenary speakers on such topics as graduate education reform, holistic admissions review, diversity, and compatible careers for advanced degree holders. Breakout sessions specifically designed for faculty/administrators, grad students/postdocs, and undergraduates interested in graduate school. The summit will conclude with a mini “grad school fair” highlighting Tulane University graduate and professional programs. 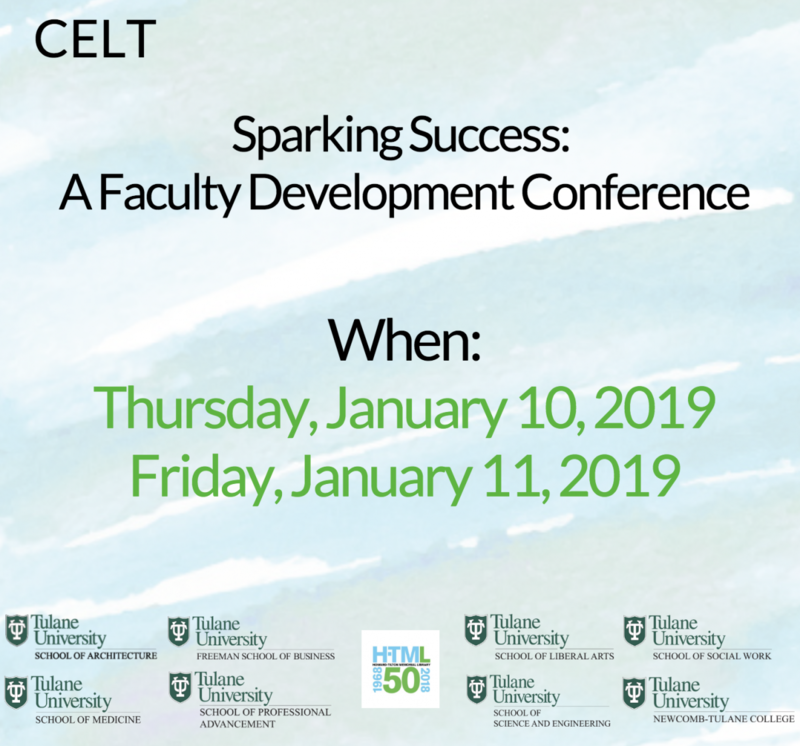 The Center for Engaged Learning and Teaching (CELT) is committed to supporting all Tulane faculty and teaching focused professionals, in and out of the classroom, through the entire arc of their career. In partnership with other University offices, we assist in providing faculty with information on such matters as personnel management (for PIs of research grants), family leave, retirement planning, and work-life balance matters. The proposed services and guides listed below are subject to change to reflect the needs and desires of Tulane’s faculty. Peer Observations are a completely no-stakes, 100% confidential way to improve and enhance your teaching through constructive, formative feedback. It is the process through which a peer provides thoughtful, informed feedback to a colleague for the purpose of enhancing the quality of that individual’s (classroom) instruction. Peer Observations consist of a pre-observation meeting, a classroom observation, a conversation between your students and the Peer Observer (PO) during the last ten minutes of the class, and a post-observation meeting. After the final meeting, the PO will delete all information from his or her computer. Further, neither CELT nor anyone else will be privy to the conversations regarding the process. Additionally, faculty members are never paired with a PO from their own department and we attempt to pair them with someone outside of their school, thus the content of the class a non-issue. To improve classroom teaching through constructive, formative feedback. To promote the professional development of individual faculty and instructors. To build a culture of faculty who genuinely care about becoming better teachers. Q: Who can participate in Peer Observations? A: Anyone who is teaching a course at Tulane University is invited to participate, including faculty, staff, postdocs, and graduate students. However, as space is limited and faculty participation will be prioritized. Q: Who Can Benefit from Peer Observations? Q: Who qualifies as a peer? A: A full-time Tulane faculty member outside of one’s home department and ideally from a different school. Q: What qualifications does the Peer Observer possess? A: Each of CELT’s Peer Observers are thoroughly trained, have been observed themselves, and have conducted multiple observations. Q: Is the outcome of the process confidential? Sign up here to work with a Peer Observer in your classroom. CELT offers one-on-one consultations with either Toni Weiss or Liv Newman. Toni has worked at CELT since 2011 and has almost over 30 years of experience in the classroom. Dr. Liv Newman has over a decade of teaching experience and led the Center for Faculty Innovation at Loyola University for six years. These consultations are meant to provide you and/or your colleagues the opportunity to confidentially discuss concerns, questions, or ideas about your teaching career in and beyond the classroom. To schedule a one-on-one consultation please email Toni Weiss or Liv Newman. CELT offers a growing library of teaching guides. If you would like CELT to make a guide on a certain subject please email your idea to celt@tulane.edu. CELT has an ever growing Lending Library filled with books on diverse topics all relevant to teaching - pedagogy, classroom management, assessment techniques, mentoring undergraduates, the science of learning, etc. Please stop into 310 Richardson building if you would like to check a book out. If you would like to suggest an additional acquisition, email celt@tulane.edu. Tulane Academic Alert System: If you are concerned about a student for academic reasons and want to let Tulane know, you may report your concerns through the online Academic Alert System. Tulane Concerns: Non-academic concerns should be filed through Tulane Concerns. Code of Student Conduct: This Student Guide includes the most frequently referenced policies related to student misconduct and is update every summer. Student Code of Academic Conduct: This Code applies to all undergraduate students, full-time and part-time, in Tulane University. The Mississippi campuses of the School of Continuing Studies will use this Code but will constitute their own Honor Board panels for those campuses. Below please find resources offered by other Universities, institutions, and organizations. If you have any suggestions for resources please email celt@tulane.edu.